The Listening section tests your ability to understand spoken English that is typical of interactions and academic speech on college campuses. 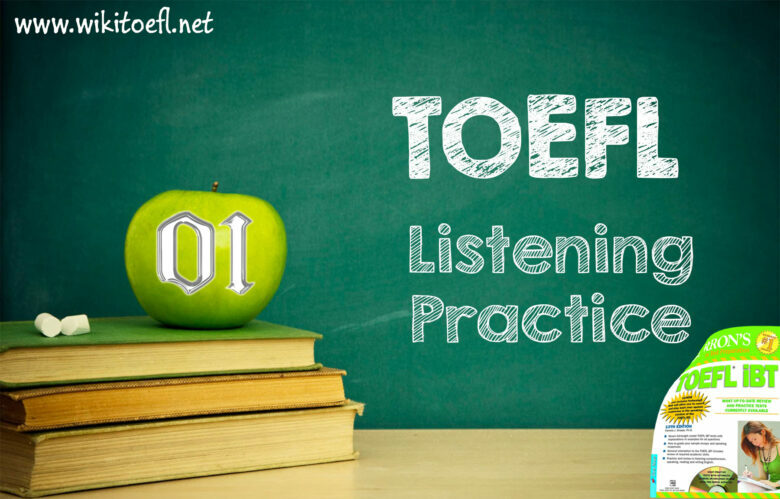 During the test, you will listen to conversations and lectures and answer questions about them. There are two conversations and four lectures on the short format and three conversations and six lectures on the long format. 1. What does the woman need? A/ She is worried that she cannot afford the service. B/ She is trying to negotiate the cost of the sessions. C/ She is showing particular interest in the man. D/ She is expressing surprise about the arrangement. 3. Why is the man concerned about the woman’s attendance? A/ If she is absent, her grade will be lowered. B/ He will not get a paycheck if she is absent. C/ She has been sick a lot during the semester. D/ Her grades need to be improved. 4. What does the man agree to do? A/ He will show the woman how to use the library. B/ He will write some compositions for the woman. C/ He will talk with the woman’s English professor. D/ He will show the woman how to improve her writing. 5. What does the man imply about the woman’s teacher? A. The professor is very difficult to understand. B. He does not know where she came from. C. Her students seem to like her teaching style. D. He is familiar with her requirements. 6. What is this lecture mainly about? 8. How does the professor introduce the dendritic drainage system? 9. Why does the professor mention the spokes of a wheel? 10. In the lecture, the professor discusses the trellis drainage pattern. Indicate whether each of the following is typical of this pattern. Click in the correct box for each phrase. A. The test questions will be very difficult. B. The students should read their textbooks before the test. C. The basic patterns from the notes will be on the test. D. The test will influence the final grade. 12. What is the lecture mainly about? 13. According to the professor, why do architects use sketches? A. Architects are not clear about the final design at the beginning. B. To design large buildings, architects must work in a smaller scale. C. Engineers use the architect’s sketches to implement the details. D. Sketches are used as a record of the stages in development. A. She is checking to be sure that the students understand. B. She is expressing uncertainty about the information. C. She is inviting the students to disagree with her. D. She is indicating that she is in a hurry to continue. 15. Why does the professor mention the drawing of Marie Antoinette? A. It is an example of a work copied in another medium. B. Drawing was typical of the way that artists were educated. C. The sketch was a historical account of an important event. D. The size of the drawina made it an exceptional work of art. 16. What is the professor’s opinion of Picasso? A. Picasso was probably playing a joke by offering drawings for sale. B. At the end of his career, Picasso may have chosen drawing because it was easy. C. Picasso’s drawings required the confidence and skill of a master artist. D. Cave drawings were the inspiration for many of Picasso’s works. 17. According to the lecture, what are the major functions of drawing? Click on 3 answer choices. Leave answer key and I will Check for you! You Got 10/11, check below for your wrong answers. You got 7/11. Please check below for your wrong answers. Hi..thanks for checking the answers..here are the remaining answers. where can I find the answers? Hi Paola, Leave your email & I will send you the detail solution! Exactly,where can we find the answers? I need the answer key for this practice set. Hi..Can you send me the answer key for this exercise? Thanks a lot! Hi Si Trang, Leave your email & I will send you the detail solution! Hi priyanka, I just have sent email for you, Please take a check! [email protected] Please send the answer key. Kindly send me the answer key. Thanks a lot in advance..!! You got 15/17. Please check your wrong answer below! How can i find the transcript of these listening . Please check your email, I just sent email to you. May I have the answer key?? Thank you in advance!!! Hello, May I have the answer keys.. Please? Check your email please, I just have sent email to you. hello can i have the answers? can i have the answers? Please , How can I find the transcripts? hi reynal, check your email, pl! hye plz send me the anskey…. Hi Swathi U, Pl check your emal. Hi Saad, I just have sent email to you. Hi, I just have sent email to you, please take a check! hi, Could you please email me the answer keys. Because I’m really confused in all of the questions. Thank you. Hi, could you please email me the answer keys? If possible, and also solutıons and transcripts? May I have the key answers please ? Hi, we have just sent you the solution, can you check it and comment below if you have any concerns! Thank you so much, I’m practicing right now. Could you please send me answer key for all listening tests 1 to 10? Hello, please send my answer key, I would really appreciate.